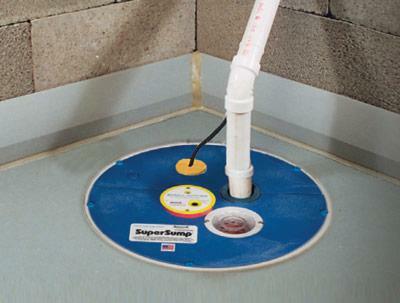 The sump pump in your basement drainage system is the heart of the whole operation. And just like the heart, if the sump pump stops working, the entire system shuts down. When that happens, your basement gets flooded. In order to put that much trust in a basement waterproofing system, you need to know you can fully rely on your sump pump. Like any integrated system, the pump is an important element but is only one of many that make up the entire system. Paying attention to these other parts of your basement waterproofing system- and the sump pump- will let you have a dry and worry-free basement for a very long time. What Makes Up a Good Waterproofing System? 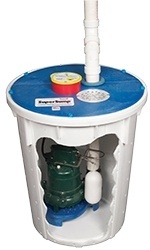 The actual sump pump itself must sit below the level of the floor. That means a rigid liner is needed to ensure the pump does not sit in a dirt-filled hole, clog up with mud and collect debris. An air-tight cover will not let collected water evaporate out into your basement, preventing moisture build-up in the air. The sealed lid will also reduce the noise the pump makes when operating and will prevent items from falling in and possibly causing failure. Having a floor drain designed into your sump lid will allow the system to collect water that may come from pipe leakage or water main breaks. The sump pump sits down in the liner where the water collects. In order to avoid the pump sitting directly on the floor of the liner where it could clog on collected debris, the CleanPump Stand lifts the pump up enough to allow sediments to not affect the pump. The pump stand also keeps debris from jamming the check valve and exit pipe. In an un-alarmed system, the only way you will know if the system has failed is if your basement floods, and by then it's too late. Having a battery-operated alarm signal that lets you know when the water reaches a certain height in the liner (above the switch on stage but below the overspill height) will save you a lot of worry. An old sump pump replaced by the TripleSafe in Boisbriand! The right combination of basement products incorporated into your sump pump system will ensure that you never have to complain about your flooded basement ever again.